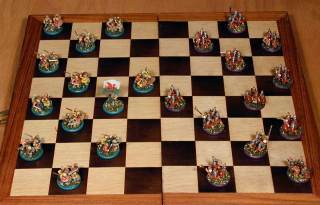 About 2000 years ago, the Welsh fought the Romans. 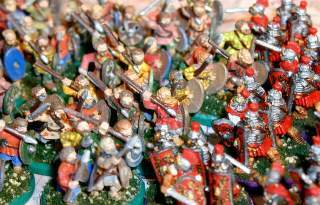 About 2000 years ago, invading Roman armies began to sweep across Great Britain. In 75 A.D., the Romans battled the Cymri (from the Welsh word combrogi or countrymen) in the western United Kingdom principality of Wales. Silvres , Demetae , Ordovices , Deceangli - these were the names that the Romans gave the locals. English speakers now call them the Welsh from the Anglo-Saxon word for foreigner. The Romans established many forts such as the one near Caerleon which helped maintain the front. 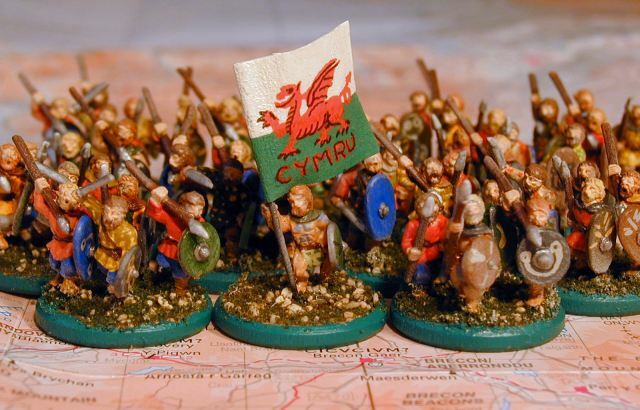 Eventually the Welsh were conquered and occupied. However, by 400 A.D., the Romans withdrew from the area, and the Emperor told the Britons to look to their own defense. The Britannia of the Romans ceased to exist, but all did not turn to anarchy. Town life continued as before, and people still carried on the Roman ways. Inlaid tile floors, heated baths, and barrel tile roofs were remnants of Roman society maintained by the British wealthy. Outsiders such as the Vikings and the Anglo-Saxons invaded, but the Britons fought back. In 516 A.D. it is believed that Britons under King Arthur defeated the Anglo-Saxons at Mount Badon, east of Bath, north of Winchester. In 537 A.D. tradition holds that Arthur died at the battle of Camlann north of Hadrian's wall in Scotland. 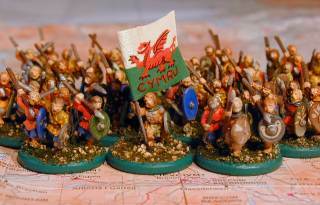 My Welsh army is based on 15 mm figures from Old Glory. I painted them with water-based Vallejo acrylics. This is my first time using this brand of paint, and I enjoy them immensely. I painted many with plaid fabrics which I was able to do only thanks to the smoothness and coverage of the paint. I gave many figures earthtones, but some are given bright yellows, oranges, and reds as many Celtic societies are known to have had. Some fight bare chested with woad-based blue tatoos on their skin. Shields are painted to mimic leather hides with Celtic emblems such as torcs and spirals. The banner is made from a small sheet of toilet tissue paper wrapped around a wire staff. The tissue is hardened with cyano-acrylic (Zap-a-Gap brand) glue. The white and green with red dragon is based on the modern Welsh national flag, but this design is believed to have been used for over 100 years. 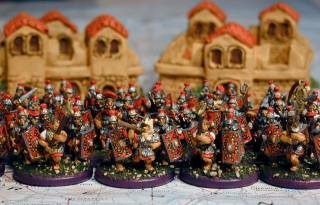 The Roman figures are also 15 mm Old Glory. 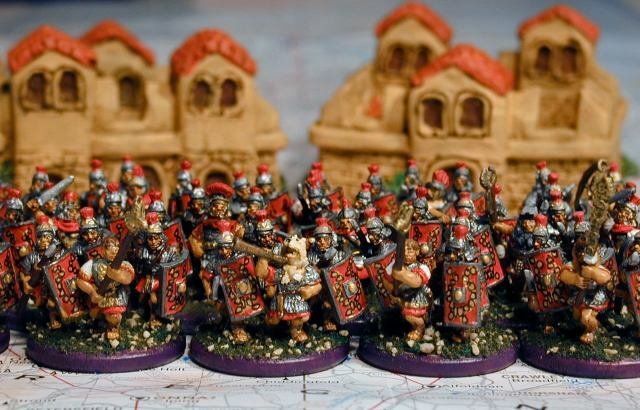 These are painted with predominately red fabrics, gunmetal steel armor and gold and silver highlights. The shields are painted with an ancient Roman leaf design. Eventually these figures are to be used for a custom, deluxe version of the Avalon Hill Britannia game. More information on this game is available at Britannia Home Page. 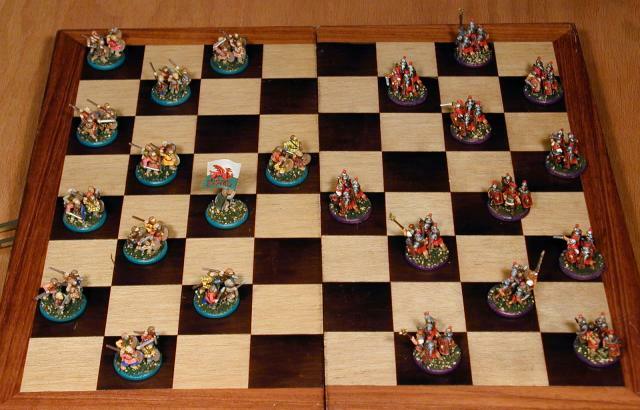 My miniatures version of the game will feature a 4 warrior unit for each of the approximately 196 counters in the game. The population marker will be represented by the unit with the banner. The board will be represented by a full color map of Ancient Britain (ISBN 031929028X) approximately 8 feet by 6 feet. It is published by the British Ordnance Survey and available at Stanford's. At the rate I am painting, it will take another 4 years before the game is complete, but what the heck, time is what hobbies are for. Last modified: Thursday, 09-Jun-2011 12:40:01 MST.